VanEast Beer Blog: Federal Government Want to Make Sure a Pint is a Pint - Maximum Fines of Up to $50,000 for Repeat Short-Pour Offenders Now Federal Law. Federal Government Want to Make Sure a Pint is a Pint - Maximum Fines of Up to $50,000 for Repeat Short-Pour Offenders Now Federal Law. The Campaign for Real Ale of BC's (CAMRA BC) Fess Up to Serving Sizes (#FUSS) Campaign received some unexpected help August 1st when the Canadian Federal Government launched their "Fairness at the Pumps" Campaign. Fairness at the Pumps states, "(e)ffective August 1, 2014, the law states that businesses who short sell consumers, on purpose or through carelessness, can face penalties or court-imposed fines of up to $50,000." 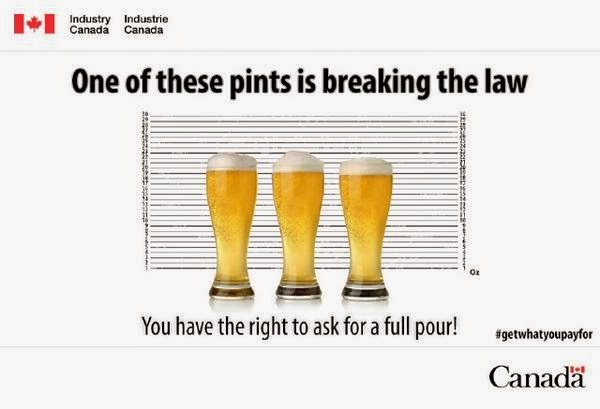 The information on Industry Canada's website, which clearly includes draft beer servings in the campaign, encourages consumers to file a complaint if they suspect they are "not getting what they paid for" and provides instructions as to what information is required to help Measurement Canada investigate and a link to file the complaint electronically, by telephone or by snail mail. They are even using the hashtag #getwhatyoupayfor in tweets, something I would recommend consumers do so Industry Canada can track interest regarding this new law. "Pubs and restaurants serve draught beer and cider in a variety of sizes - generally, 9 oz., 16 oz. or 20 oz. glasses, or by the pitcher (approximately 60 oz.). If unsure, British Columbians are encouraged to ask establishments what their serving sizes are, so they can be sure of the per-ounce price they are paying and be better aware of the amount of alcohol they are consuming. As part of the terms of their licence, B.C.’s licensed establishments must have a drink list available to consumers that outlines their serving sizes. If consumers have concerns about the accuracy of serving sizes offered at an establishment in B.C., they can contact Industry Canada: http://www.ic.gc.ca/eic/site/icgc.nsf/eng/home"
Until this announcement the BC Liberals have brushed off CAMRA BC's complaints that many pubs and restaurants do not declare their serving sizes and if they do list them, they do so inaccurately. Although they do not state they are going to enforce the law and put the ball clearly in the court of the consumer to follow up, the Liberals have at least acknowledged publicly to consumers this serving size list requirement exists and also have acknowledged that not knowing how much alcohol you are consuming can impact consumers in a negative way, something CAMRA BC has been pointing out to the LCLB & the Liberals for years. Now it appears that Industry Canada is ready to go to bat for draft beer consumers in our country but here in BC the only fly in the ointment is that if the LCLB does not enforce strictly the need for posted serving sizes, and a licensee has no listed serving size, then consumers cannot complain they are being short-poured as they will not know what a full-pour measure is. For the Measurement Canada to able to investigate a serving size issue, they need to know what that serving size is supposed to be. Conveniently, the Liberals left out the information that if a licensee cannot produce a serving size-price list for their alcoholic beverages, you can make a formal complaint to the LCLB at lclb.lclb@gov.bc.ca or by calling 1-866 209-2111 and they are compelled to send a liquor inspector to investigate and enforce the law. Both levels of government have put the burden of responsibility onto consumers who they are advising to file complaints if draft beer servings are short-pour or misrepresented. If you really want to make sure a pint is a pint and stop this practice of misrepresenting serving sizes and short pouring by some licensees, you need to take action and file an official complaint. Both the Canadian Government and BC Provincial Government have opened the door, acknowledged there is an issue and given consumers the information they need to kick in that door for good, but it is up to consumers to ensure they get what they pay for. If you are short-poured or an establishment does not have a serving size list when you ask for one, try to resolve the issue by talking to the management of the establishment in a polite manner. If you still cannot resolve the issue to your satisfaction, put the government bureaucrats to work and file a complaint. It be fantastic to be able to say you live in a province where a pint is a pint!